This is about a time and a childhood place not far from my own. 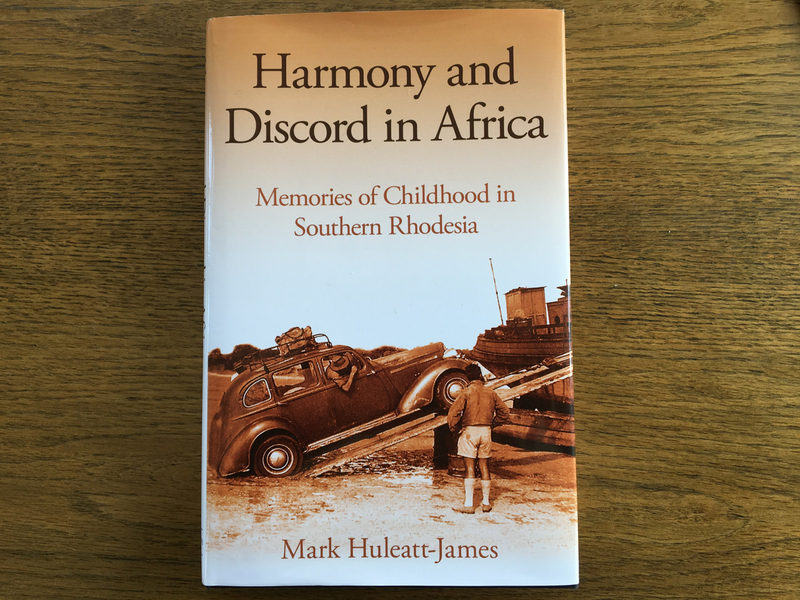 Harmony and Discord in Africa, despite its title, is not a political book but rather a slice of ‘home history’ about a boy, his family and their life on a farm in the young British colony of Southern Rhodesia . Mark Huleatt-James’ family arrived in Salisbury (now Harare) in April 1949. He was born the following year and stayed in the country, on a succession of farms, until the family moved to Zambia in 1966. His parents, like many young Europeans, were in search of a better life away from post-war Europe, and as they settled other members of the family came out to join them. The author includes two sets of grandparents in this story, with his father’s mother being particularly influential. She loves reading and keeps Salisbury’s library in a flurry of dispatches as it tries to keep up with her appetite for travel books. Clearly knowledgeable, well-read, and well-travelled, she needs something to do so she gets permission to set up a small, grant-aided school in the farmhouse for the benefit of Mark and the children of other local farmers. She must have passed on to her grandson her interest in the world and in others, because he is able to put together a vivid neighbourhood jigsaw of local individuals, and their origins. Many are recently rooted, with some more settled than others on land that is mostly new to commercial agriculture. These are boom years in Rhodesia, especially on the farms, which means opportunity for some, and displacement for others as land is cleared to make way for large scale farming. The author acknowledges both groups, but keeps his sharpest focus on his own relatives. The impression he gives of their time, neither easy nor glamorous, on the farm in Raffingora and on holidays in Mocambique, is that it is cheerful, hopeful and surrounded by relative peace. He draws a detailed picture of friends, hazards and happiness, of flooded roads, of the bush and of boarding-schools. It’s a life that’s easy to recognise for anyone who grew up on a farm out there at the same sort of time. The book ends in 1966, the year the family moved to Zambia, following a storm in 1964 which destroyed the farm’s recently harvested crops. Their move comes just ahead of the violence which later ripped apart the country’s commercial farming communities. As a result of this timing, Harmony and Discord in Africa gives a rare, relatively trauma free insight into a European family and their experience of developing a farm on what was, at one point in time, Rhodesian land … now the struggle-stained soil of Zimbabwe. It is a clear, detailed record of adventurous years, sifted from the memories of childhood. This entry was posted in Books, Books on Zimbabwe, Non-fiction, Reviews, Zimbabwe and tagged Africa, Book Review, childhood, farming, Mark Huleatt-James, Raffingora, Rhodesia, the land issue, Zimbabwe. Bookmark the permalink. Sounds very interesting, I lived in Zim from 1973 to 2002 so this would resonate, i am sure.